My feet are really messed up. Always have been. I am pigeon-toed. I collapse my arches. My ankles are weak. And I am slightly knock-kneed. My ninth-grade wrestling coach told me my stance in the standing position looked like, and I quote, “a crow in heat.” The comparison delighted my buddies. I wasn’t so crazy about it. Now that I am middle-aged, I’m not so pigeon-toed. The collapsed arches are the major issue. Without pretty beefy arch supports, I break down shoes in no time flat. I shied away from low-cut hiking shoes for years because I wanted the extra support of hiking boots. But let’s face it, it’s a lot more comfortable on shorter hikes and hot days to just wear hiking shoes. I keep my rugged leather boots around for backpacking trips. I like lower cut shoes on day hikes, particularly in the desert. I recently wore out a very good pair of Columbia shoes, so I shopped around early this summer for a replacement. I decided on the Vasque Mantra Gore-Tex cross-training shoe. I’ve done more cycling then hiking so far this summer, but I’ve been on foot enough to break in the Vasques. They fit my narrow foot well. They were snug from the get-go but didn’t cause any blisters. My first big hike was up Cooper Creek to the old Pitkin Iron mining area. It was mostly up a road so it was a good break-in. The next major hike was up Electric Pass, so it was a better trial. They held up well – providing plenty of support and traction on the uphill; and comfort on the downhill. My toes didn’t get schmooshed against the front, as long as I had them laced tightly. We encountered steady rain after we got off the high pass and its barren and descended closer to Cathedral Lake. The waterproofing kept my feet dry and the shoes themselves dried off very quickly once the rain let up toward the trailhead. I removed the “dual-density footbeds” that are supposed to provide all-day cushioning and shock absorption and replaced it with a full-foot insert with extra arch support. I didn’t feel like I sacrificed comfort. The cut is a bit higher than my Columbia, but the weight of the Mantra is listed as a few ounces more than 2 pounds. 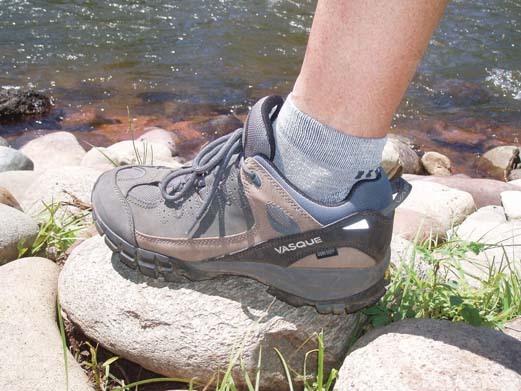 Vasque touts the Mantra as light enough for trail running and rugged enough for serious hiking. So far, so good. The Vasque Mantra is carried at a variety of sporting goods stores at a suggested retail price of $130. That was a bit steep, but the salesman I dealt with claimed the durability make them worth it. I hope so.